HUGH HEWITT: Morning glory, America. It's Hugh Hewitt. Bonjour. Hi to our Canadian friends. That music means it's time for the Hillsdale Dialogue. The last radio hour of each week is devoted to a conversation about the big issues, the long lasting, the enduring ones, either with Dr. Larry Arnn, president of Hillsdale College or one of his colleagues. Today, we are honored to have Dr. Matthew Spalding back with us. He is the director of the Kirby Center-- the Hillsdale College lantern of reason, the lighthouse of sweet argument and persuasion in the shadow of the Capitol. Dr. Spalding, Good Friday the 13th to you. MATTHEW SPALDING: Good morning here. How are you doing? HUGH HEWITT: I'm great. We'll talk about the Supreme Court in just a second. I've got to bring you up to speed with a little breaking news. Theresa May is sending out a desperation email to her MPs to join her for tea at Chequers today at 3:15. It kind of looks like that government is falling apart, Matt Spalding. And I posited in the last hour, if you go against the center of your party, the party will break you. You won't break the party. And I believe she betrayed the party on Brexit. Your assessment? MATTHEW SPALDING: No. I think that's absolutely right. I think that she has shown weakness on that from the beginning. She thought she could hold it together, and now it's collapsing. This is an example of where President Trump going over there and making his arguments and laying out things reveals what's going on. I think he made apparent what was already shattering in that government. I don't see how it can hold up under this. I also think that Merkel is not in good shape in Germany either. I think the effect of the Trump presidency in Europe is to bring to the fore a lot of these internal debates, which have been percolating under the surface in Brexit, in England. I think this is going to just implode. HUGH HEWITT: Yeah. My prediction is that by the end of next week, Michael Gove will be the prime minister of Great Britain in a caretaker, hard Brexit fashion, and that they'll have a real leadership election once Brexit is done. And then they'll go to the people. And they'll say this is what we've done. I think they'll win. But Michael Gove-- I just don't think you can carry on when you try and go against the center of the party. With Donald Trump, who's not really a Republican in the traditional sense, but he did do the number one and two things-- rebuild the military, $700 billion this year, $716 billion next year, and appoint the judges. These are the number one and two things. And so he's not battling the core of his party like May is. MATTHEW SPALDING: Well, he is and isn't. Remember, there's a certain sense in which, I think, he's done those things you suggested, but he does challenge, if you will, the general elite leadership that existed, the status quo. And I think by being very open, by pushing on some things, which were considered sacred doctrine-- trade policy, for instance-- I think he's raising some questions and opening up the political field in a way that it hasn't opened in some time, which I think is good, which among other things leads to very good outcomes on judges and challenging the administrative state. In that sense, I think that what Trump represents, this breaking down of that status quo, is a larger movement, which we are seeing in Brexit before him and now playing out in England and some other countries. I think there is this general populist mood against the modern bureaucratic states, which exist here, and it's overwhelmingly in European countries, which is exactly what led to Brexit in the first place. HUGH HEWITT: Matt Spalding, Michael Barone-- the esteemed Michael Barone-- described this as the classic countryside versus the capital dynamic, which has its roots all the way back to the French Revolution and even before, and back to the social war in the time of the Roman Republic, that the countryside inevitably revolts against elites when the elites get too uppity. You have lived here for how long? How long have you lived in the beltway? MATTHEW SPALDING: Too long is the technical answer but about 20 years, more than 20 years. HUGH HEWITT: So to be in it is not to be of it. So I'm back now. And so I don't consider myself of the beltway. I lived outside of it for 30 years. I've lived 60 of my 62-- I guess more like 55 of my 62 years outside of the beltway. But there are wonderful friends here who I know you know who are part of Never Trump. But they really are less than a dozen people when you come right down to it. The people in the movement who have decided to leave because of Trump are about a dozen people. And I think their influence is radically overstated, especially when it comes to issues as clarifying as the Kavanaugh nomination. MATTHEW SPALDING: No, no. I completely agree. I think it's overstated because they're in places that gives them a lot of influence, especially media and popular influence, so their voices are heard. But I think it's diminishing radically and quickly. I also think more and more of those that their initial reaction was never Trump are becoming, well, maybe Trump, and, wow, this is producing a lot of good things here. Look, the claim here for Trump never was, this is a reincarnation of George Washington or Abraham Lincoln. This is the kind of presidency we need at this moment right now. And he needs to break through some things, clear some ground, and he's actually going to keep his promises that he ran on, which turn out to be the things, not only where the American people are, but the kinds of things that conservatives have been advocating for a long time. And the judges are very popular right now, very significant. But if you look at it more broadly, this guy is proceeding and pushing forward through his OMB, through his restructuring, through his challenges on regulations. He's really the best challenge to the administrative state and bureaucratic rule that has happened in this country since Reagan made those arguments back in the '80s. That's extremely significant. And despite what you might think about him, his character, his family, his tweets, that is a significant turn for this country. That is about the restoration of constitutional government, which, oh by the way, is why the court versus country debate in this country is contained within a constitutional structure, which is our saving grace. And on that side, on that question, Trump's on the right side here, and I can't see how you can fundamentally be opposed to him on that score. HUGH HEWITT: Now, let's turn to the court. And for full disclosure for people listening, it's not a podcast. I was disappointed because I was a Raymond Kethledge fan. I still am. I really wanted Judge Kethledge. He didn't win the contest, but Brett Kavanaugh is a fine center right, John Roberts 2.0. Your reaction to Judge Kavanaugh. HUGH HEWITT: That's absolutely not an attack. MATTHEW SPALDING: In the range of originalism, he's closer to Roberts than he is closer to Scalia. But gosh, think about where we are and where we've come from and what potential this could lead to looking ahead as this plays out. This is an excellent pick. He's more than qualified. And I've been going back and reading decisions and thinking through various questions, and it's really hard to find something in someplace where there's a fundamental disagreement. Maybe here and there, there would be some nuance, but I think a lot of that can be explained by his position as a lower court judge, his thinking, his structure, his frame of mind, which is the important question is solidly originalist. And we will now have an originalist majority on the Supreme Court. HUGH HEWITT: For the first time in my lifetime. And this is where I go to the rule of four, which I tried to described in the Washington Post yesterday. MATTHEW SPALDING: Which was a great column. HUGH HEWITT: Well, thank you. The docket changes rapidly, and I don't think that people quite understand how significant it is to replace an unpredictable, almost whimsical Justice in Anthony Kennedy with a solid, predictable originalist. Expand on that for the minute that we have left in this segment. MATTHEW SPALDING: No, no. I think, first of all, the point about Kennedy being whimsical, he was unpredictable and all over the place, in final decisions, but also in determining which cases come before the court. So there was really no pattern there. And then, you had a very weak, flimsy jurisprudence. I mean, think about the mystery clause, about the mysteries of human life. That is now changed. You're going to have an organized majority. You're going to have solid four, not counting the Chief Justice, which is absolutely key. Four, besides the Chief Justice, that can get those cases there. They're going to be probably pushing him, pushing Roberts, and the Roberts court, having those decisions come before the court, which now means you actually talk about judicial strategy and what we like to call jurisprudence. What is the prudence of the court in terms of moving this in a direction which is going to restore a sense of an original understanding of the Constitution? That is monumental, historically monumental, in terms of the, not only jurisprudence, but Congress, the presidency, the states, the status of the Constitution in our lives as a self-governing republic. HUGH HEWITT: When we come back, we'll talk about the specifics, but Matt Spalding is completely right. Dr. Spalding and I will agree on a lot. But here's one thing I'm going to emphasize. Chief Justice Roberts is very conservative. He's had to trim that conservatism because he had to keep Anthony Kennedy on the right side as much as possible. But he is an originalist. He is the real deal, and that is going to flower in the next few years for everyone to see. I'll be right back with Matt Spalding on the Hillsdale Dialogue. All things Hillsdale at hillsdale.edu. Stay with us. HUGH HEWITT: Welcome back, America. It's Hugh Hewitt on the Hillsdale Dialogue. All things Hillsdale are found at hillsdale.edu. Even though I'm in the Relieffactor.com Studios, this is the Hillsdale Dialogue, all of which dating back to 2013 are collected at hughforhillsdale.com. Today's guest, Dr. Matthew Spalding, is director of the Kirby Center, the DC outpost of Hillsdale College. Dr. Spalding, let's begin to walk through the consequences of a Kavanaugh confirmation, which I believe is assumed. What do you think is the overall impact on separation of powers? MATTHEW SPALDING: Oh, let me make a very quick point just to emphasize something you said at the end of the last segment about John Roberts as the Chief Justice. I think you're absolutely right on the read about him. He will now have a working majority. His Chief Justiceship, the Roberts court, will now change. I just finished reading a biography of John Marshall. I like to go back and study these things. I'm actually teaching that in a course this fall. And there are cases in which John Marshall actually went with the other side in order to set up the circumstances for future cases. So the job of Chief Justice, if you're really serious about jurisprudence, about shaping the direction of the court, is very significant. And you can't always merely follow a certain doctrinal read of things. There's a certain prudential judgment that you do in building cases. That's my general point. 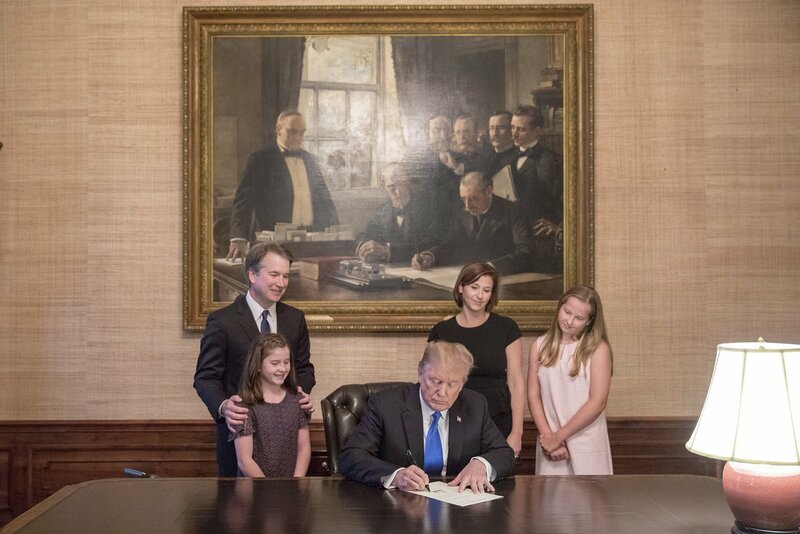 That's now going to shift if he's got four guys to his right and not Kennedy. But I think the most important thing that shifts here-- we can talk about the details in Chevron and this particular thing, and you get down in the weeds-- but the larger picture's the most important thing because what originalism primarily means is you're looking to not parts of the Bill of Rights, but the whole Bill of Rights, and more importantly, not the Bill of Rights, but the whole Constitution, which, first and foremost, is a structural document, which means you see three branches of government. The vesting clauses are central, and you have a judicial power, an executive power, and, first and foremost, you have a legislative power. And I think that that understanding will now be a dominant view on the court, which means everything is seen through that prism, which means they're going to be looking at all these cases that come up in terms of how it fits within the Constitution. When we talk about the separation of powers, that's what we mean-- the back and forth between the branches, the checks and balances that we normally think of when we remember Schoolhouse Rock and things like that. But more importantly, everything government does because the Constitution has been passed and affirmed by the sovereign American people, it is the only law to which they have taken their allegiance. They look to that thing, and everything the government does has to fit between the corners of the Constitution. HUGH HEWITT: And I want to preempt a little criticism here-- the Constitution as amended because the original Constitution contained within it a process by which it could be legitimately amended. It has been legitimately amended, especially with regards to the original stain of slavery. And that is gone. And so the 14th Amendment, when we say originalism, we're talking about the original 14th Amendment. When we say textualism, we're talking about the text of the 25th Amendment. We're talking about everything understood as a whole. MATTHEW SPALDING: To which, originalism sometimes is thought original means old. What original means-- it does mean old, but it also more importantly means the original sovereign intent, which means the document itself, which includes the amendments. So your point is absolutely right. It doesn't mean going back to the late 18th century. Justice Scalia wrote a great piece, this is decades ago, in which he talked about, we're not about restoring flogging here. There's a certain sense in which the Constitution is a living document because it's alive, because it's supported by the sovereign people. It is the document that forms our nation. But it includes the amendments. They look at the thing as a whole, not some part of it, more than another part, the whole thing, including the amendments, which last I checked is still a great document. It's not been fundamentally amended in a way that is problematic. It's been deconstructed. It's been interpreted badly, but the whole thing is still workable. It's still great. It's still monumental. HUGH HEWITT: For the most part, it's not hard. People get mad at me when I-- I've been teaching it for 22 years. Except for the 11th Amendment, it just isn't that hard. The 11th Amendment is hard. But for the rest of it, it is just not that doggone hard. I'll be right back, America. We make it hard because lawyers like to make money on it being hard. But it ain't that hard. It's meant to be read and understood. I'll be right back with Matt Spalding on the Hugh Hewitt Show. The Hillsdale Dialogue continues. Welcome back America to the Relieffactor.com Studio inside the Beltway. I am Hugh Hewitt joined by Dr. Matt Spalding for the Hillsdale Dialogue this week. Each radio last hour of the week is devoted to all the big issues of the day and of history. And I'm usually joined by Dr. Larry Arnn, president of Hillsdale College, or Matt Spalding. Dr. Spalding is the director of the Kirby Center-- Hillsdale's lantern of light in the Capitol. Or one of their other colleagues from the college up in Michigan that is the lantern of the north. Dr. Spalding, when we went to break, we were talking about the effect of a Kavanaugh appointment to the Roberts court. And I want to return just to a moment to originalism and textualism. A lot of the left wing know-nothings think that this is a call to racism, that it is a call to the old strict constructionism. In fact, originalism and textualism are different things. You can have both in a judge. And there are different varieties of originalism. HUGH HEWITT: But let's just say-- you already announced what originalism is. Let's talk for a little bit about textualism because it is here where Brett Kavanaugh's record is actually most teased out in his 300 opinions, especially on the Major Rules Doctrine under Chevron. But talk a little bit about what textualism is. MATTHEW SPALDING: No. I think you're right. And there you start getting into the nuances between the range of the Roberts and now potentially Kavanaugh, all the way over to Thomas and Alito, other justices. Scalia, in this sense, was mostly a textualist as well. They're all originalists. But there's a particular thing called textualism, in which the actual text of the Constitution and the text of the law, the text that you're comparing in order to make your constitutional analysis become crucially important. And you don't go beyond that, or you do it very slightly, but the text itself is the overriding matter. And you alluded here to, which you're absolutely correct, where this becomes very important for Kavanaugh, who is more of a textualist, is looking at what the text of the law says relative to things like Chevron, which is deference to agencies when the text of the law passed by Congress is ambiguous or confusing. I think Kavanaugh will have a much stronger, harder read. He will find less ambiguity there. He will read it on its face. And that will bring a voice that will be very strong, which I actually also think will draw Roberts in as well because he actually tends to be somewhat of a textualist, I think, more than a broader originalist as well going back to, for instance, the Obamacare case. I think actually Kavanaugh was better on the health care question as a lower court judge. His reasoning there was very tight. And he would have actually probably thrown it out because if it was a tax, he would have thrown it out because it didn't originate in the House. He was being very textualist. Roberts was doing more kind of I'm the Chief Justice. I've got to figure out how to keep comity and strength in the court here. So I think Kavanaugh's texualism will actually have an effect of pulling him into that majority, which is good. But I think you'll see a lot more things looking specifically at congressional laws, reading very tightly, and that will actually have a strengthening of the separation of powers in and of itself, which would be an extremely good addition to the court. HUGH HEWITT: Matt, I've had a long-running argument with my good friend, Mark Levin. I think that national independent and federation-- Sebelius, the Obamacare decision, was a brilliant decision by the Chief Justice for a lot of reasons but especially because of its political consequences downstream of destroying the Obama coalition, of giving teeth to the Spending Clause, of getting five votes for the Commerce Clause Limit, for a whole bunch of different reasons, kind of a brilliant decision. But with a five person majority now, we will see them roll out in ways we have not seen before. And I want to pause for a moment on Chevron deference for the Steeler's fans. Chevron is the name of a case. The holding of that case is administrative agencies are presumed by this court to have expertise that Congress is aware of and that we are going to defer to. Ever since that disastrous decision, courts have genuflected the federal agencies, except on what is known as the Major Rule Exception, where they've begun to come back in. I would not be surprised to see the Chief Justice write a decision as definitive as Citizens United was or, in our recent case, repealing the right of unions to loot their member's paychecks, repealing Chevron and saying, no. Courts are going to take a hard look at every one of your rules against the statute from which it came. MATTHEW SPALDING: No. I think you're right. I think the Chevron doctrine is probably one of the leading examples of something that's going to come out of this particular appointment. But having said that, I think we were tending this way. Look at last term when even Justice Kennedy was raising questions about Chevron deference. So I think we're going to go that way. I think it will pull Roberts in. I think there'll be a definitive and strong argument here. But again, let's emphasize on what the broader context for that is. The argument was that they should defer to agencies in reading ambiguous statutes. That's a violation of originalism in terms of an originalist understanding, a reading of law generally. It's not necessarily conservative or liberal. It's to what extent do deferred agencies as opposed to Congress would actually made the law. And I think there we're in line for a powerful decision because this has gone way off the rails, way beyond any reasonable argument that I think-- this doctrine goes back to Rehnquist and Scalia when it was first introduced. It's gone way beyond that. And I think there'll be a clear majority. The only question is how strong that decision is. I think it's likely going to be strong because one place-- I think the primary place where Kavanaugh's the strongest overall, writing this majority is going to the strongest overall is pulling back what we call the administrative state and the bureaucracy. And that's why the president picked Kavanaugh in the end. MATTHEW SPALDING: Don McGahn, the White House Counsel, is a bird dog on this. MATTHEW SPALDING: He knows what he's doing. And there's a logic at the Supreme Court and below it to dismantle the administrative state and administrative law. And this is a piece of it, but there's an overarching strategy here. HUGH HEWITT: We could have a Lochner-like reversal on Chevron that will shake every agency to its core. But I'm also looking forward to clarity on the first two clauses-- the religion clauses-- because now with five judges-- the Establishment Clause is so distorted from what it originally was intended to do. Anyone familiar with Madison, anyone familiar with Jefferson, anyone familiar with the Federalist Papers, and the time of the founding, the Establishment Clause is easy. We have turned it into a nightmare of Kresch cases and Ten Commandment plaques when it isn't that. And the Free Exercise Clause is easy. We have turned it into hairsplitting, when it ought to be a robust defense of liberty of conscience. I think Justice Gorsuch will take the lead here. And I think we're finally going to get rid of a lot of the wreckage of the First Amendment case law of the last 15, 20, 30 years. MATTHEW SPALDING: Absolutely right. And again, I'll make two broad points. One is what we will see much less of are these crazy little tests and determinations and scrutinies and things and a broader view of what the purpose of the First Amendment is, which you've outlined. It's been reversed. Free Exercise is supposed to be very broad, and Establishment was supposed be very strong but specific. And we reversed that, number one. Number two, you pointed something out, I think, unintentional, which is very important. You have a majority of five people, we're focused on Kavanaugh. We've been talking about Roberts. But in a majority of five people, the Chief Justice plays a key role, but the different justices underneath him are going to take leads on different issues, and their expertise is going to come out. And your point, Gorsuch is going to take the lead on that one. And I think that's how you build a majority and how you actually have a very significant majority because they're going to have different things they're focusing on. And that's great. That's exactly how an originalist court should work. HUGH HEWITT: People might want to know. I'm just predicting here. I'm just spit balling. I think Justice Thomas is going to put teeth into the Spending Clause with the support of his colleagues. And I think Justice Alito is going to take the First Amendment speech and association rights and make sure that they are-- as he just did, as he just wrote. He just handled the union dues case. MATTHEW SPALDING: That's right. So in the past when we thought about these guys, when Scalia was there in his heyday, he was writing. He's in a minority. He's dissenting. He's writing for the future. And we all, this is all terrible. What was going to happen? Now it turned out that all of these decisions and all these set-ups-- You've got your team. You been putting people in place. You've got a team now. They have different expertise. You've got a majority. You've got a Chief Justice who, I think, actually knows how to be a Chief Justice. And now, you let them go and follow and pursue their arguments. And the four underneath the Chief Justice have the floor in order to call cases to the court. And so now, you can think strategically. And Roberts can think now on a 30, 40 year plan. HUGH HEWITT: And by the way, I think Justice Kagan will join them because she wants to go to the party. I don't know about the other three, but she wants to go to the party. Justice Breyer may want to come into the party for antitrust as well and trade tickets at the door. Let me propose to you. Let me pose to you as well. I think the Chief will take the lead on finally eradicating affirmative action. He wrote in dissent last year, or two years ago, the way to end racial discrimination is to end racial discrimination. It was really brilliant. I also think he will put the stake through the redistricting meddling that Justice Kennedy always kept the door open, always wanted to try and get in there. And I believe, again this is just a prediction, I think the Chief Justice is going to reinvigorate Takings. I do believe, finally, after 30 years, people's property is not going to be trifled with by the administrative state anymore. MATTHEW SPALDING: Look, I agree, but let me point out generally. This is not like we've been waiting and having this planned, locked in a basement closet, and now we're going to brush it out and put it in play. These things, the logic of them, have already been out there. This is not some sort of revolution. In many ways, it's a change that's been implied and coming for some time, but now you can actually carry it out. MATTHEW SPALDING: --as well, Takings. One thing to keep in mind here is that the court rightly takes cases in controversies that come before them, which means we can't predict completely what's going to come up, how it's going to come up, and the particulars of the case. So we can't predict the extent of the case for that matter either. The most important thing is the logic behind this majority, does it cohere, is there a consistency to it, and can it be ready when cases come before it. And can they strategically pick and choose cases to try to direct it as much they can? HUGH HEWITT: And they've got a menu of 8,000 cases per year from which to draw. We'll come back after the break and talk about that. Stay tuned. It's the Hugh Hewitt Show. Welcome back, America. It's Hugh Hewitt. Thank you for listening today. The president and the prime minister will be giving a joint news conference shortly and will probably be carried by Mike Gallagher. We'll probably be carrying it on many of these stations, so be sure to watch that. Matt Spalding is my guest. Dr. Spalding is the president of the Kirby Center of Hillsdale College. All things Hillsdale are found at hillsdale.edu-- hillsdale.edu. And, of course, all of these dialogues dating back to 2013 are found at hughforhillsdale.com. Dr. Spalding, let's finish by talking about-- everyone else talks about Roe, and it really ought to be Planned Parenthood versus Casey, the privacy rights. There are 8,000 cert petitions every year before the court, between 7,000 and 8,000. They can choose the new majority in October to go in any direction they want, but they can't just choose, because they're limited by cases and controversies, to reach out and reverse Roe. A state must act first, usually a 20-week restriction, which I believe they will uphold, and they will rewrite it with great deference towards the states. But let's be clear, abortion in some states, such as California and New York, is in the state constitution. And this court is not for changing the state constitution, is it? MATTHEW SPALDING: No, I think that's absolutely right, which points to a broader point here. We could talk about the marriage decision as well, which is the courts, by their very nature, are not ones who fundamentally change the political direction of things. They're not supposed to. They're not supposed to legislate. And, in this case, they really can't fundamentally correct some of these questions. What they can do is they can open it up so that legislative bodies in Congress and the federal level and the states can have those debates. And we can have an open debate in which you can have legislative accommodation. And then the courts can come in and say, you can do that, you can't do that. So I think that abortion will come up in cases. There'll be regulatory questions. There'll be medical questions. But a fundamental challenge at the national level probably is not going to occur coming up through a case. More likely, it's going to start over time devolving to states and legislatures. But my point is that's exactly the way it should be, and this goes back to this overall, I think, movement here. Let's keep in mind here that originalism means ultimately, and the most important thing which we're not talking about, is a de-emphasizing of the courts. We have for too long made the assumption of judicial supremacy, and sometimes we conservatives also put too much emphasis on the courts. When in reality, what an original understanding of the Constitution means-- the Constitution is a political, law-making, popular, self-governing document-- it means a lot of emphasis, as much as you possibly can, goes back to law makers. And I think that's extremely important for us to remember, if no other place, with something like abortion and questions like marriage and religious liberty. Legislators, where they can make accommodations, are the best place to have these kinds of conversations, not before courts, which make binary decisions, winners and losers, and set the kinds of precedents which become very problematic politically. There's no prudence in the current court system. One of the most important things is for jurisprudence to rightly push it out to the popular branches of government. HUGH HEWITT: Well said, Matt Spalding. On that note, I will thank you. And we are going to cut away from the Hillsdale Dialogue and listen to Theresa May in Great Britain. THERESA MAY: Turning to our economic cooperation with mutual investment between us already over $1 trillion, we want to go further. We agreed today that as the UK leaves the European Union, we will pursue an ambitious US-UK free trade agreement. The Chequers agreement reached last week provides the platform for Donald and me to agree an ambitious deal that works for both countries right across our economies, a deal that builds on the UK's independent trade policy, reducing tariffs, delivering a gold standard in financial services cooperation, and as two of the world's most advanced economies, seizing the opportunity of new technology. All of this will further enhance our economic cooperation, creating new jobs and prosperity for our peoples for generations to come. The UK-US relationship is also defined by the role we play on the world stage. Doing this means making tough calls, and sometimes being prepared to say things that others might rather not hear. HUGH HEWITT: Time for me to go. America. It sounds like everything is rosy. The president will talk shortly. Mike Gallagher, on many of these stations, will bring you the latest, or our local programming will. The media likes to overstate all this stuff. It looks like the president and the prime minister are getting along well. But I think at this time next week, it's not going to be Prime Minister May. I really don't. I think it's going to be Prime Minister Gove. Write it down. We'll talk about it next week. Thank you, Adam and Duane. Thank you, Ben and Mason. Thanks to all of you for listening. Thanks to Matt Spalding in Hillsdale. All things Hillsdale at hillsdale.edu. All of our conversations at hughforhillsdale.com. I'll be back on Monday with the next Hugh Hewitt Show.